Bryndzové Halušky (in English: "Potato dumplings with bryndza sheep cheese and bacon") is one of the national dishes in Slovakia. This hearty meal consists of Halušky (boiled lumps of potato dough similar in appearance to gnocchi) and bryndza (a soft sheep cheese), optionally sprinkled with cooked bits of smoked pork fat/bacon. There is an annual Bryndzové Halušky festival in Turecká that features an eating contest. The ingredient that makes this national dish of Slovakia a favorite is the sheep's milk cheese, which has a slightly sharper taste than the non-flavored goat cheese spread available at many US grocery stores, in the refrigerated dairy section. The most abundant ingredient is the raw potato, which comprises most of the dough that creates the potato dumpling (halušky), and is a major staple in the Slovak diet. After the grated potatoes are mixed with the flour (and salt), they are molded into small cylindrical chunks of 3 cm., and gently placed in boiling (and if desired, salted) water. When the dumplings rise to the top of the boiling water, one is removed to check if the dumpling is thoroughly cooked, then the still-hot dumplings are removed from the pot of boiling water with a slotted spoon, and placed on a warmed plate. 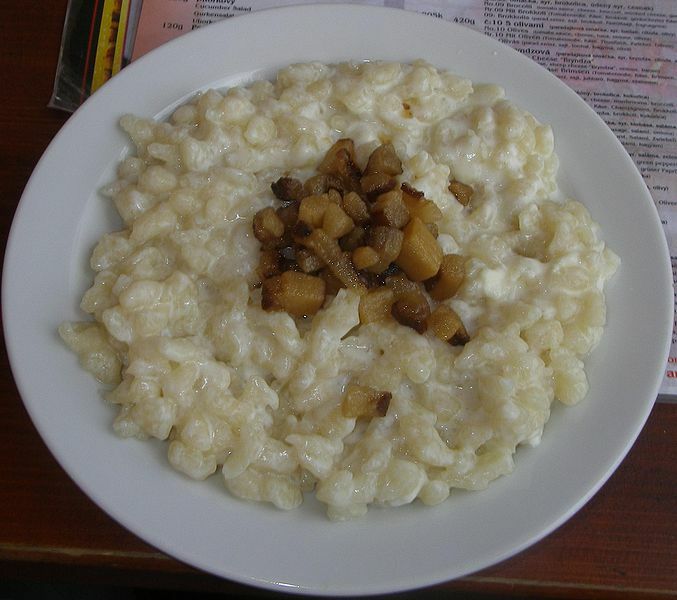 Immediately after dumplings are placed on the plate, small chunks of sheep's milk cheese (bryndza) are placed on top, causing the cheese to melt over the potato dumplings. Prior to sprinkling the crispy pork bits on top of the bryndza, some may prefer to mix up the potato dumplings and bryndza first, then serve piping hot. Žinčica (a drink made of sheep milk whey similar to kefir) is traditionally drunk with this meal.